The books we created are going to be sent to seeds of learning a nonprofit organization aimed at improving the literacy of Nicaraguans. So eventually the books we create will go to Nicaraguan children. I came up with this idea because I have a strong intrest in space and propulsion. I also wanted to teach a lesson of asking questions and learning to the Nicaraguan kids? 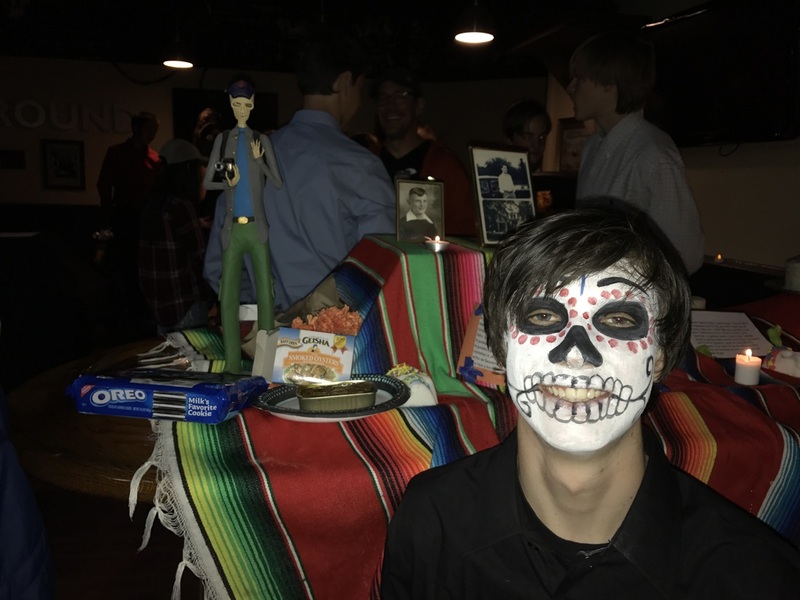 What is the day of the dead? The day of the dead it a holiday mostly celebrated in central and south America. The holiday is based of the belief that the dead travel back to their homes and families and need a couple days to rest and party, woo! The holiday is a combination of the beliefs of the native aztecs and the catholic conquistadors. This night is a party to celebrate the dead with alters offerings and lots of food. For the exhibition I made an alter for my grandfather, being a person that died when I was little I didn't know very much about what he was like. Because I didn't know much I ended up calling my grandmother and asking her about him, and having a great conversation about what he did and what he was like. one of those thing was food. I found out that one of the things he liked most in life was good food, and heard many funny storys about him hiding food for later. During this project I ended up doing as little work as possible. For most of the work time I jut threw together some crafts and when it came time gathered up some things for my alter. I still put in work but I think that I could have done better. I feel like this project had a high bar of what you could do but the minimum was tiny.